I grew up in the age of instant everything. Convenience ruled the day, especially when it came to food prep. With the arrival of processed food, the likes of Hamburger Helper, Instant Breakfast, and Potato Buds filled supermarket shelves. Working moms opted for the quickest possible route to a family dinner, and my Mom was no exception. A full-time 5th-grade school teacher, she worked all day and always had dinner on the table at 6 o’clock sharp. Macaroni and cheese in the little blue and yellow box was a staple in our lazy Susan cabinet. I never questioned the packet of yellowish-orange powder that magically turned into cheese sauce with the addition of milk. All I knew was that I liked it. I’m sure it was the only version I had until adulthood. It wasn’t until I left the nest that I discovered the joys of homemade mac and cheese. Fast forward many years, and you would never catch me eating boxed mac and cheese. However, I will most definitely eat made-from-scratch mac and cheese with collards and a cornbread topping. Especially one that’s made with four cheeses and a little bacon thrown in for good measure. 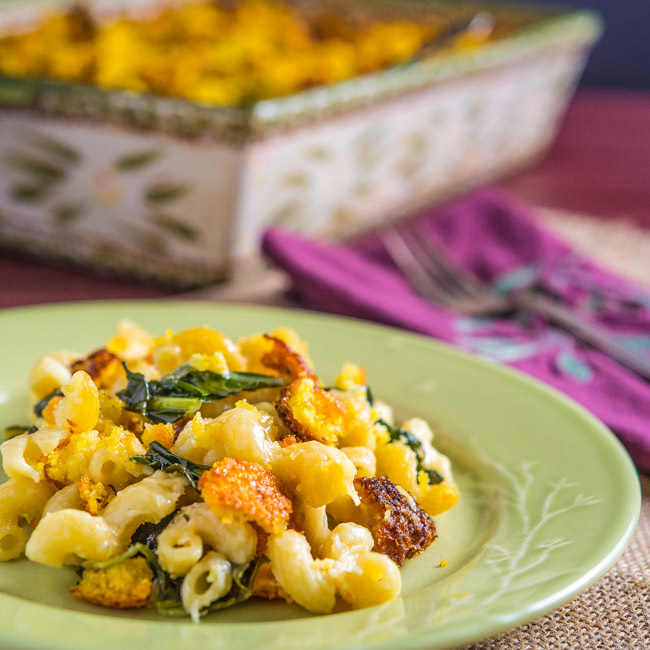 Recently, I caught an episode of The Chew where Clinton Kelly made a version of mac and cheese with collards for guest, Jennifer Nettles. I loved the idea, so for today’s post Clinton’s idea inspired me to put my spin on this classic dish with a Southern twist. 1. Preheat oven to 425 degrees. In a small bowl, whisk cornmeal, egg, and buttermilk together until combined. 2. Melt butter in a well-seasoned 8-inch iron or an oven-proof non-stick skillet. Pour butter into batter and whisk to combine. Pour batter into heated skillet and place skillet in oven. Bake for 20 to 25 minutes or until top is golden brown. Remove from pan, cool completely, and break into small pieces. 1. Cook bacon in a large skillet over medium high heat until browned. Remove bacon and set aside. Transfer collards to skillet and saute 2 to 3 minutes until wilted, tossing regularly with tongs. 2. Bring a large pot of water to a boil. Add pasta and cook according to package. Drain. 3. Transfer cheeses to a large bowl and toss to combine. In a medium large sauce pan, melt butter over medium heat. Add flour and whisk until well combined. Cook for 2 minutes. Gradually add milk, continuing to whisk. Continue heating over medium heat, whisking regularly, until sauce begins to thicken. Add nutmeg and 1/2 of the cheese to sauce and whisk until cheese is melted. 4. In a large bowl, mix cooked pasta, collards, reserved bacon, and cheese sauce until combined. Transfer half of mixture to a 9"x13" baking dish. Top with half of reserved cheese. Pour remaining mixture into the dish and top with remaining cheese. Top with crumbled cornbread. 5. Reduce oven temperature to 400 degrees. Transfer dish to oven and bake for 30 minutes. Remove from oven and serve immediately. You know you had me at collards — but then you went and through in smoked gouda, too. You rock, Bill! This right here is making my knees weak! I can’t even deal with how delicious this looks. I love the incorporation of collards in this! Haha – it’s funny but I refuse to buy those little boxes of mac and cheese and my daughter always bugs me too! Bill, I prefer your version with bacon and collards to that stuff in the blue box!